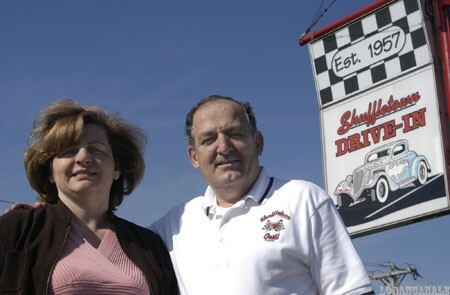 After 22 years at Athens Restaurant, the beloved Uptown diner that closed in 2006, former co-owner Serafim Sam Housiadas and his wife Maria found a new culinary home at the Shuffletown Drive-in near Mountain Island Lake in northwest Charlotte. Both Greek immigrants, they learned to love food by spending time with their family in the kitchen. Creative Loafing: What do you like to eat? Maria: We love to cook. Sam does the cooking here, but I cook at home. As much as we love the food here, I try to cook a little bit healthier at home: more vegetables, leaner meats. In the summer, we have a small garden. What brought you to Charlotte? Sam: I grew up in a small town exactly 292 km from Athens, Greece. The first time I came here was Nov. 2, 1975. I didn't speak English, but language was never a barrier; everyone was very kind. I moved to New York, met and married Maria and we returned with our daughter on March 27, 1982. Maria: My family emigrated from Greece when I was about 6 years old. My father owned Hastings Center Restaurant in Hastings on Hudson, NY. Do your children also work in the food industry? Sam: They have all worked in the restaurants and our youngest, Kosta, 24, still does. Maria: My father moved to this country with only a fifth-grade education. He was successful, but he worked really hard. It was his wish that all of his children be educated. Two of our children, Joanna, 27, and Athan, 25, are out of college and have their own jobs. Kosta graduates in the spring. Their plan is to stay in their own field, but they know this is always here if they need a fallback. We'd love to keep the restaurant in the family, but we'll see what happens.